The club can confirm that it has once again rejected an offer for Estonian International striker Henrik Ojamaa. As was reported in the national press earlier in the week, the 22-year old was subject to an bid from a Polish Ekstraklasa side. However, the fee involved falls considerably below what the club deems acceptable for the player, who has ten International caps to his name. Chief Executive Leeann Dempster said: “We understand there is likely to be a considerable amount of interest in Henrik given just how well he has performed since arriving at the club in January 2012. “He scored five goals in his first seven matches after joining the club and created more goals than any other player in the Scottish Premier League last season; that obviously hasn’t gone unnoticed. Ojamaa is currently with the Estonian national side as they prepare for friendly matches in Tallin against Belarus [3rd June], Trinidad and Tobago [7th June] and Kyrgyzstan [11th June]. Following Celtic’s William Hill Scottish Cup Final success on Sunday, Motherwell have been confirmed as entrants in the Third Qualifying Round of the 2013/14 UEFA Europa League. The matches in this round will be scheduled for Thursday 1st August, with the return leg one week later, Thursday 8th August. The seedings are yet to be confirmed but it is likely Stuart McCall’s side will go into the draw unseeded. Seeded teams already confirmed for the Third Qualifying Round include the likes of Udinese, Club Brugge, Saint-Étienne, Swansea City and Bursaspor. The draw for the Third Qualifying Round will take place in Switzerland on Friday 19th July. The club will confirm additional information around any proposed charters and ticketing information when more details of the opponent become clear. For more information on the 2013/14 UEFA Europa League, vist the UEFA website. Motherwell Football Club is today delighted to confirm manager Stuart McCall has opted to stay on as manager despite interest from English League One side Sheffield United. Following a formal request, the Bramall Lane club were granted permission to speak to Stuart last week. However, the 40-times capped former Scotland midfielder, who is contracted until the summer of 2015, has decided to continue on with his role at Fir Park. Commenting, McCall said: “It has been a really difficult last few days. As most people probably know, I spent five great years at Sheffield United. “I was grateful to the board for allowing me to speak to them but I went with an open mind. I had no desire to leave Motherwell after enjoying two-and-a-half great years at the club. “There is no doubt Sheffield United are a fantastic club but, after careful consideration and deliberation, I am more than happy to continue my current role at Fir Park. “I have built up a tremendous feeling for Motherwell, the people who work at the club and the supporters. It would take something really special to tempt me away. Chief Executive Leeann Dempster added: “Our admiration for Stuart and the job he has done in the two-and-a-half years at Motherwell is certainly no secret. “However, we think it is only right never to stand in our staff’s way if a big offer comes in. That is why we granted permission and respectfully remained silent during the process. “That being said, we are absolutely delighted our manager has decided to stay with us. Stability and continuity when we are changing the squad is very desirable so it’s a huge bonus to have Stuart continue in his current role. Nicky Law has today completed his pre-contract move to Scottish Third Division Champions Rangers. Law, 25, joined Motherwell in the summer of 2011 from Rotherham United and has enjoyed two terrific years at Fir Park. He has helped the club finish ‘best of the rest’ in both 2011/12 and 2012/13, playing a major creative role from midfield. He also played in both the UEFA Champions League, against Panathinaikos, and in the UEFA Europa League, against Levante U.D. in what was a memorable 24 months for the Steelmen. Schooled at Sheffield United as a youngster, Law notified the club some weeks ago of his intention to leave at the end of his contract. He departs having played 86 games, scoring 13 goals. A number of clubs were reportedly interested, but the Englishman has chosen to move to Ally McCoist’s Rangers as they plan their assault on the Scottish Football League Second Division next season. Everyone at Motherwell Football Club would like to sincerely thank Nicky for his fantastic contribution whilst at Fir Park and wish him every success in his future career. The two-day course, which runs on Friday 24h May and Monday 27th May, will provide a fun programme for attendees. For our football enthusiasts, we will have a wide range of football activities from dribbling, passing and shooting through to penalty competitions, and small-sided games. We are passionate about improving the skills of all our players and our experienced SFA Accredited coaches will help young players take themselves to the next level. Prices are £10 per day or £20 for the full 2 days; half days are also available for £5. The sessions will run from 9am-4pm, for more information on what you need to bring with you as well as bookings, visit www.motherwellsoccerschools.com. Alternatively, phone the Motherwell Football Club Community Trust on 01698 239 926. The Motherwell Football Club Community Trust has become one of the first professional clubs in the country to be awarded the SFA Quality Mark. This award is in recognition of the valuable contribution to grassroots football, that Community Trust make on a daily basis, offering the local community the chance to get involved with the club. The Community Club Award, part of the Quality Mark Accreditation Scheme run by the Scottish FA in partnership with McDonald’s and sportscotland, recognises pro-active clubs and schools working to increase youth and community participation. Clubs and schools receive the award after meeting standards in areas such as coach and player development, management, administration, welfare and planning. There are four Quality Mark categories – Standard, Development, Community and Legacy. So far more than 400 clubs and schools have achieved accreditation over the categories, and over 5,000 coaches have benefited from coach education and first aid training. McDonald’s, Scottish FA’s community partner since 2002, are committed to helping young footballers shine by attracting 13,000 new volunteers and 10,000 new coaches by 2014, as well as supporting 600 clubs and 52,000 players through new and existing football networks. Through Quality Mark, McDonald’s and the Scottish FA aim to provide support to grassroots clubs and schools across Scotland as they strive to broaden youth and community participation and to enhance player, coach and volunteer development. 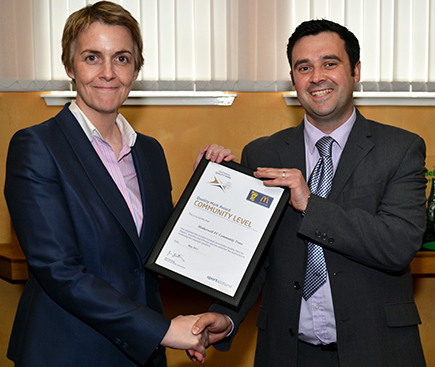 The Quality Mark Accreditation Scheme is supported by sportscotland, the national agency for sport. sportscotland has one clear focus – to develop a world class sporting system for Scotland – and works with partners to build success for Scottish sport. sportscotland is a key partner in the delivery of youth football programmes, investing over £1m per year in activities including employment of club development staff, discounted coach education and training for volunteers. Graeme McArthur, Programme Development Manager for Motherwell Football Club Community Trust explains “We are delighted to have received this award in recognition of the hard work that everybody within the Trust has put in since its inception. Alan Taylor, Regional Development Manager for the SFA continued “The Scottish FA are delighted to recognise Motherwell FC Community Trust as a Community level Quality Mark club, the award is in recognition of the quality provision that the club offer to players within the non professional game. After 38 rounds of Clydesdale Bank Premier League fixtures, the online predictor game Score Selector from SPL sponsor Clydesdale Bank has been won by Motherwell fan, Nancy Buchanan. Nancy, whose Score Selector screen name is ‘NANCYMFC’, racked up an impressive 170 points during the 2012/13 season correctly predicting an impressive 29 exact results along the way to lead the chasing pack by nine points. “Congratulations to all our winners and of course to Nancy our newly crowned Score Selector Champion. To correctly predict 29 exact results in what has been a highly competitive Clydesdale Bank Premier League season is an impressive achievement to say the least. Michael Higdon has been awarded the Clydesdale Bank Premier League Golden Boot for finishing the top goalscorer in the league this season. Higdon has played a huge part in Motherwell’s success by scoring 26 league goals to help his side finish in second position in the Clydesdale Bank Premier League. Michael has scored many goals this season, but one of his most important may have been his penalty against Celtic in a 3-1 win for his side that confirmed Motherwell’s place in the Europa League next season. Higdon topped the Clydesdale Bank Premier League goalscoring charts with 26 goals, closely followed by Billy McKay from Inverness Caledonian Thistle and Leigh Griffiths from Hibernian who both scored 23 league goals this season. In what has been an incredible season for the 29-year old former Crewe striker, Higdon has broken Wullie Pettigrew’s post-war record for most top league goals in a season, was named the Clydesdale Bank Premier League Player of the Month on two separate occasions and became the first ‘Well player in history to be named the PFA Scotland Player of the Year. He also scooped the Motherwell Supporters Association Player of the Year, completing a sensational campaign. Everyone at the club would like to congratulate Michael on yet another accolade. The club can confirm the following squad changes as of Saturday 1st June 2013. Motherwell Football Club would like to sincerely thank all the players who are leaving the club for their efforts whilst at Fir Park and wish them every success in the future careers. Midfielder Paul Lawson has become the first signing of the summer after penning a two-year deal this afternoon. The 28-year old former Celtic and Ross County man will be officially registered on 1st June when his current deal with the Staggies expires. Lawson began his career at Celtic Park and was skipper of the reserve side whilst a regular feature in the then Scotland Under 21 squad. He played four times for Celtic’s first-team, including a starting slot against Aberdeen back in May 2006. He enjoyed loan spells at both St Johnstone and St Mirren before joining Ross County in the summer of 2007. Six years and 178 games later, he has opted to return to the central belt after a fabulous final season at Victoria Park, starring for Derek Adams’ side as they secured a top-six finish. Speaking exclusively to MFC TV, he said: “It’s great to have my future sorted out. There is a lot of uncertainty around Scottish Football so it’s really pleasing to have things sorted early doors. “I enjoyed my time at Ross County. I have been pleased with my performances and thankfully the manager [Stuart McCall] spotted that and came in to sign me.